Cape Town - Experienced props Tendai Mtawarira and Coenie Oosthuizen, as well as inside centre Damian de Allende, all return to the Springbok starting team to face Ireland on Saturday evening (kick-off at 19:30 SA time) at the Aviva Stadium in Dublin. The match is the first of four end of year Tests that also include internationals against France, Italy and Wales. 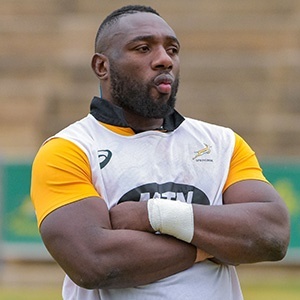 Mtawarira, the team’s most experienced player with 95 Test caps, comes back into the starting line-up at loosehead prop while Steven Kitshoff, who made his starting debut against the All Blacks last month in Cape Town, will move back to the bench, where he has been very impressive this year. “Modern day rugby is about using 23 players effectively, and having Kitshoff coming off the bench with 30 minutes to play has worked well for us this season,” said Springbok coach Allister Coetzee.